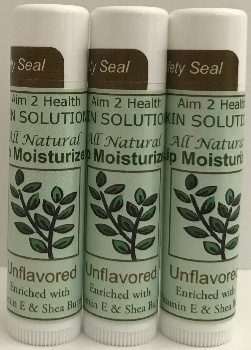 Our all natural unflavored lip balms contain the perfect ingredients your lips need to repair and stay moist and healthy. They quickly revitalize dry, cracked, and split lips fast and effectively! Contains absolutely NO mineral oil and NO petroleum. Why Our Lip Moisturizers Work! Lip balm has been around for over 100 years. The inventor of lip balm, Dr. C. D. Fleet, started an unfortunate trend by using petroleum jelly in his Chap Stick lip balm, and it's only become clear in recent years just how ineffective petroleum jelly is as a lip balm. Since petroleum jelly isn't absorbed by the skin, it keeps the skin from breathing and over time -- actually makes your lips more chapped. The all natural and moisturizing ingredients in our lip balm has a healthy effect on the skin that is completely different from that of petroleum jelly. Instead of lying inert on the surface of the lips, our lip balm is absorbed by the skin cells. Because it improves the moisture retention capacity of your lips, your lips stay healthy and moist even in the driest conditions. Our all natural ingredients both moisturize the skin and restore the skin cells' elasticity. These are two very important features! When our lip balm is applied to the lips, not only are the cells hydrated, but they gradually regain their natural elasticity so that they are better able to keep moisture from escaping. The primary ingredient shea butter contains both a high moisturizing fraction and an extraordinarily high healing fraction and is a wonderful agent for revitalizing our skin cells so that they get back their moisture retention capacity.